Sewing has been a part of my life almost as long as I can remember. Growing up, my bedroom was right at the top of the stairs in our house, and my mom had a sewing room/closet directly at the bottom of the stairs. To me, one of the sounds of the Christmas season was hearing my mom sewing late into the night. Most every year she would make each of us (myself and my two sisters) something that she had sewn as a gift… a quilt, a stuffed animal, or a dress. Still today, my mom continues to enjoy sewing and quilting and makes lots of beautiful things as gifts and for her (and my Dads’) home. My sister’s and I each learned the basics of sewing from my mom, and at different times in our lives we’ve enjoyed dabbling with sewing projects. When I was preparing for my wedding (at the ripe old age of 19), I signed up for a sewing class in college and made my own wedding dress as my class project. My daughter Grace, now 8, has taken quite an interest in sewing, and although I could teach her myself, I knew she would enjoy taking some sewing classes from a “real” teacher. She’s been taking classes at our local quilting store and loves showing off the tote bag and skirt that she’s made so far. 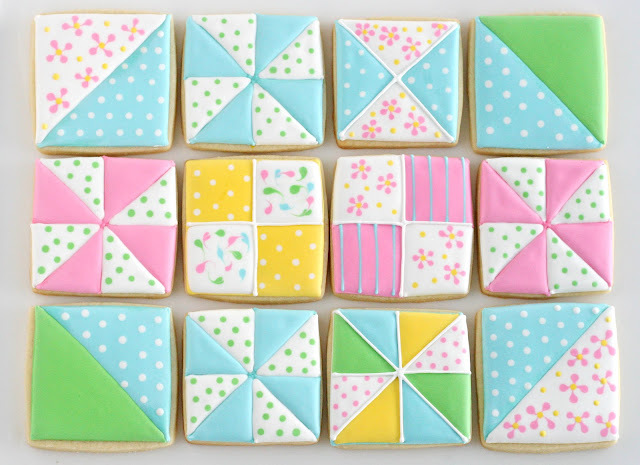 I’ve been wanting to make some sewing and quilt cookies for a while, and when I realized that a (sewing loving) friend’s birthday was coming up, I thought I could make fun cookies for my friend, as well as some for Grace’s sewing teacher. 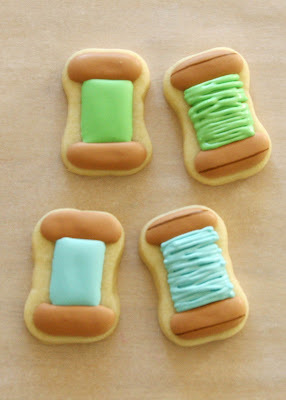 Want to make some sewing and quilting cookies too? Let’s get started! 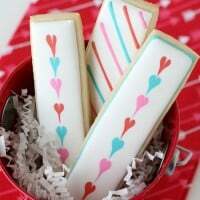 I started with my go-to Sugar Cookie Recipe and Royal Icing Recipe (the post with the royal icing recipe also includes lots of cookie decorating basics, if you are new to cookie decorating). Because each of the cookie designs in this set required some drying time between steps, I began with the first steps on each design, then moved on to another cookie shape/design. By the time I had done one portion of each cookie, it was time to move to the next layer of design. As you can see above, I did the first color on some of the quilts, then I move to some buttons (using a great tutorial from Sweet Sugar Belle), then I started on the spools of thread. 1. 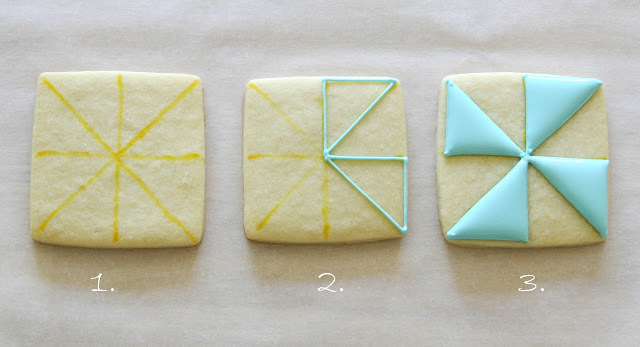 Decide on your pattern, and use a light colored edible marker (and a ruler) to mark your desired design. 2. 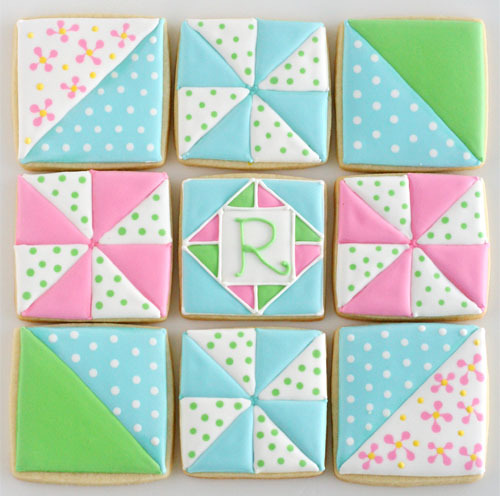 Begin your pattern, using a piping/outline consistency icing to outline the areas for your first color. 3. Fill in the outlined areas (with a medium/flood consistency). Allow this color to set/dry (1-2 hours) before adding the next color, in the remaining space. 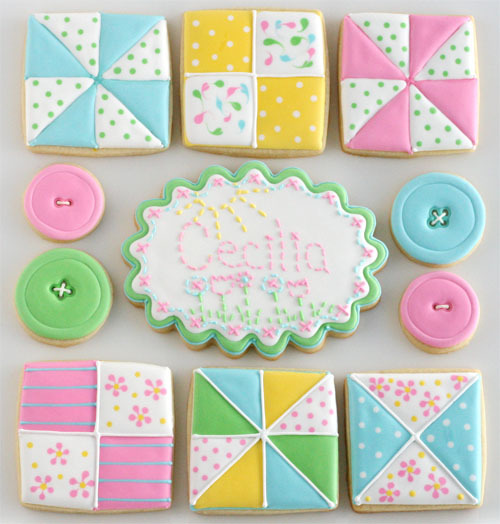 These cute and simple cookies were inspired by Sweet Sugar Belle. I used a mini dog bone shaped cookie cutter, and stretched it open just a bit. Using a medium consistency brown icing, pipe the top and bottom of the “spool” (as shown in an above photo). Allow the brown “spool” area to set/dry (1-2 hours) before adding the “thread” color. Fill in with the “thread” color, in this case blue or green. Allow that section to set (1-2 hours) before adding the final detailing, the top layer of “thread” in a thicker/piping consistency. I also added a thin line on the “spool” with a brown edible marker to add just a bit more definition. My favorite cookies from this set were the two centerpiece cookies (inspired by Maryann/ Cookie Artisan’s centerpiece cookies). I outlined each cookie in two different colors (allowing a little drying time between colors) then flooded the cookie in white. When that base was dry I used piping consistency icing and a #1 tip to pipe my messages to resemble embroidery. When I mentioned to my daughter (Grace) that I was making some cookies for her sewing teacher she said that I should make a cookie that looked like a sewing machine. I didn’t think I had the skills to do that in a way that would actually look like a sewing machine, but I said she could do it! So I outlined and flooded a square cookie, allowed it to dry overnight, then let her bring her idea to life using edible markers. I love that she was braver than I was! And I think she did an adorable job (see her cookie below)! P.S. Any comments you have on her cookie I’ll gladly pass along to her. These are adorable. I love the flowers and dots. I'm laughing, because I have also tried paisley quilt cookies myself, and it seems we only do one before we decide better of it. 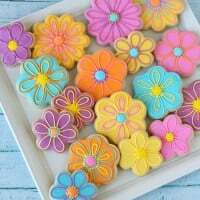 The cookies are fantastic!! I’ve seen quilt cookies before, but none of them have looked as good as yours along with the spools and buttons. How fortunate for your friend and Grace’s sewing teacher that the two of you think so much of them to do all this work. Please tell Grace she did a super job with the sewing machine. She even drew stitches along the edge of the fabric!! Hmm, I think she’ll not only be a great seamstress, but a cookie decorator too. I love to know that children are learning these skills that will bring them happiness throughout their life. 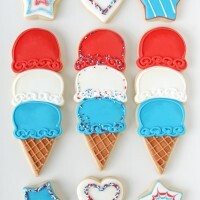 Pingback: 25 Craft-Inspired Desserts That Are (Almost) Too Cute To Eat | シ最愛遲到.! Absolutely adore these & aiming to make some for my (quilt-loving mom) before my next trip home! I love it!! how long can I store this type of cookie? Absolutely love the cookies. Sewing is my favorite hobby and baking is so much fun also. Love the time with children. 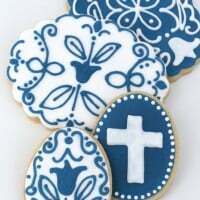 Do you know where I can buy cookies like these? My mom is turning 75, she made all of my clothes when I was younger and still dabbles from time to time and I would like to have cookies like these as party favors/ thank you notes. Those cookies are absolutely delightful. And must have taken a long time to make. Congratulations on a beautiful job. 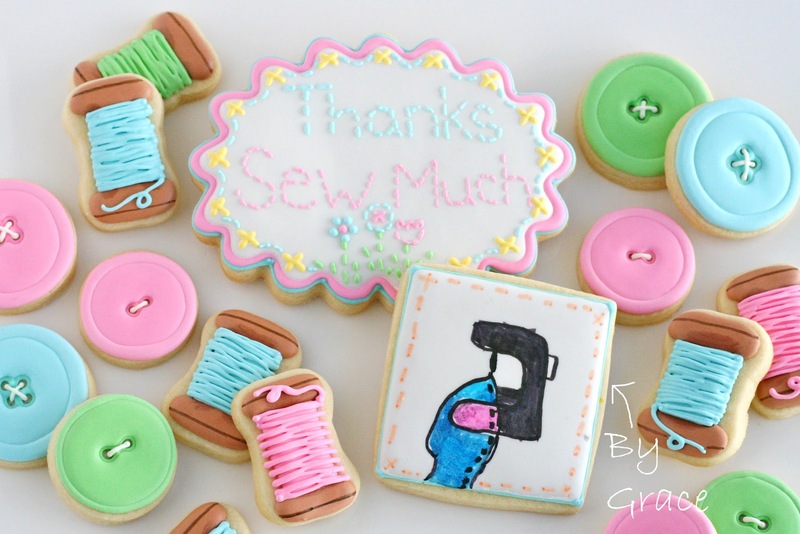 Your daughter is quite talented, not only with her sewing but creative with decorating her sewing machine cookie! 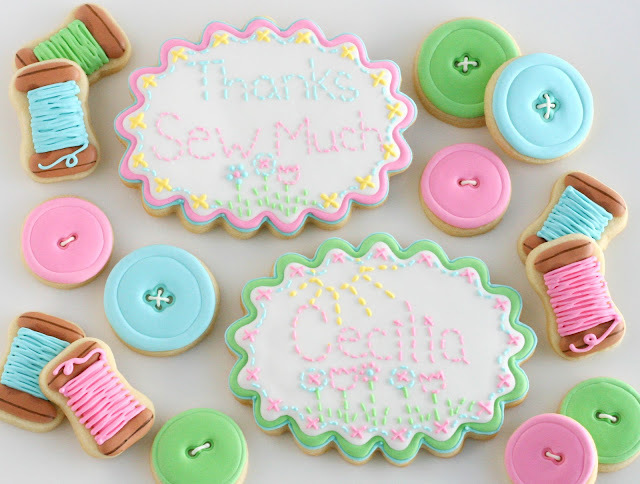 You have done a marvelous job inspiring her to follow along with you and your mother in sewing, quilting and baking! Well done, mom! !